The holiday season is a time of both reflection and celebration. Today, we reflect on nearly a century of service and our past year by sharing our Annual Report with you. In our 2015-2016 year, we provided almost a thousand hours of volunteer service to the community, through both our own programming and partnering with twenty-two additional community organizations. We organized more than 45 volunteer events, awarded educational scholarships to refugee students, opened our Inside the Grin pediatric oral health exhibit at the Duke Energy Children’s Museum, and participated in the passage of the Fostering Connections Act. 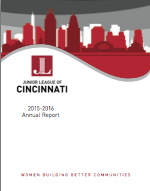 And of course, we point with pride to more than 120 projects and organizations that have been incubated or impacted by the Junior League of Cincinnati since our founding — many of which continue to serve Cincinnati today. But we are only able to accomplish this work only by the generosity of our members and our community. And so, this holiday season, we are asking you to celebrate the Junior League of Cincinnati by making a donation to our Annual Fund Campaign. Our Annual Fund not only supports our existing programs, but also allows for security and sustainable growth of our organization. A gift to our Annual Fund is a true vote of confidence in the Junior League, and a demonstration that you believe in our mission of promoting voluntarism, developing the potential of women, and improving communities through the effective action and leadership of trained volunteers. By supporting our Annual Fund, you amplify our work even further. I hope you’ll read our Annual Report with excitement — and I hope you’ll give in an amount meaningful to you.